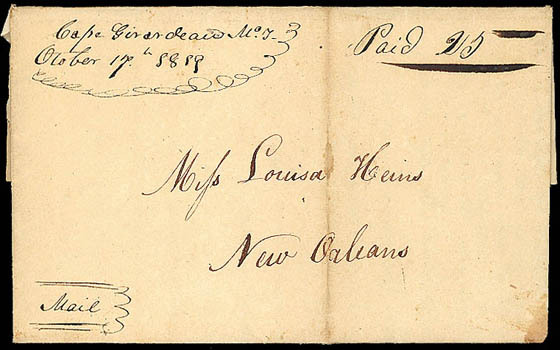 (Missouri) "Bellair Mo, Feb. 19", manuscript postmark with matching "40" rating on 1851 folded letter to Sacramento Cal., endorsed "On the wings of the wind, to the fare west to the above in hast"; some edge toning, slight wear, F.-V.F., a scarce 40¢ rate from Missouri. (Missouri) "Cannon Mines 19th Septm. 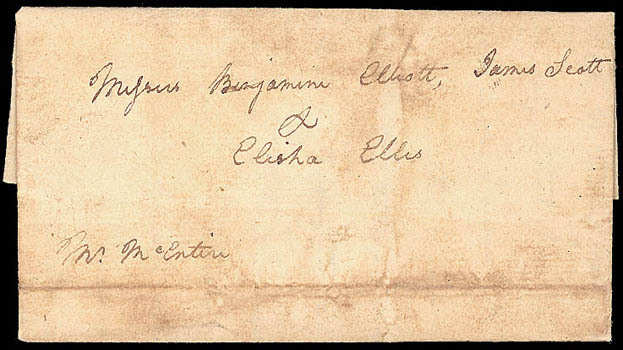 1809", dateline on folded letter addressed to Messrs. Benjamin Elliott, James Scott and Elisha Ellis, carried privately by "Mr. McEntire" as Cannon Mines did not have a post office; some toning and file fold, Fine. The writer is the famous eccentric, Joseph Smith T. Originally named Joseph T. Smith, he reportedly disliked such a common name, which he shared with a cousin he also disliked. His solution was to move the "T" to the end of the name, creating one that was uniquely his own. (Missouri) "Cape Girardeau Mo. 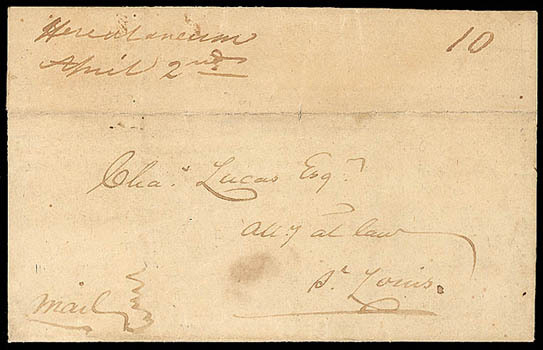 T., October 17th 1819", manuscript postmark and matching "Paid 25" rating on 1819 folded letter to New Orleans La. ; light fold toning, F.-V.F. Cape Girardeau was first settled in 1794; the town was incorporated in 1805 and the post office was established the next year. It is located on the Mississippi River, about 150 miles south of St. Louis. This cover is from the Cox-Heins correspondence. In it Cox reports to his future wife on the seemingly interminable trip from New Orleans to St. Louis, which he began by steamboat on August 16, 1819. 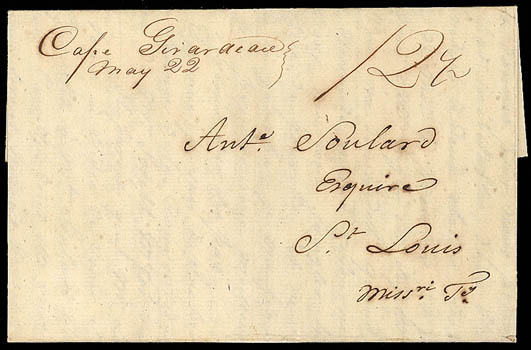 (Missouri) "Cape Girardeau, May 22", neat manuscript postmark with matching "12½" rating on 1820 folded letter to St. Louis, Missouri Terr., Extremely Fine and choice. This letter illustrates how quickly some of the French residents of Missouri Territory integrated with the incoming Anglos from east of the Mississippi River. The writer, B. Cousin, tells his friend, Soulard, that he has married "…l'aimable Eliza M. Hunt…" and that he has become the temporary clerk of the court during the absence of Joseph McFerron, who is attending the Constitution Convention leading to statehood for Missouri. (Missouri) "Fort Osage Mo, Aug 26", manuscript postmark with matching "25" rating on 1841 folded letter to William F. Plunkett at Lexington Ky., letter to brother starts "I have delayed writing to you until I have procured a situation owing to a late law of the Legislature almost all the schools had to be reorganized. I am now teaching a district school near this place…"; edge faults, Fine. (Missouri) "Herculaneum, Augst 13", manuscript postmark at left and matching "50" rating on 1814 folded letter to Harrodsburgh, Ky. containing court deposition acknowledged and signed by William Clark, "Governor of the territory of Missouri, commander in chief of the militia thereof & superintendent of Indian Affairs" and is attested by Frederick Bates, Territorial Secretary and later Governor; some minor staining and reinforcing, F.-V.F., This is the earliest recorded use from Herculaneum. 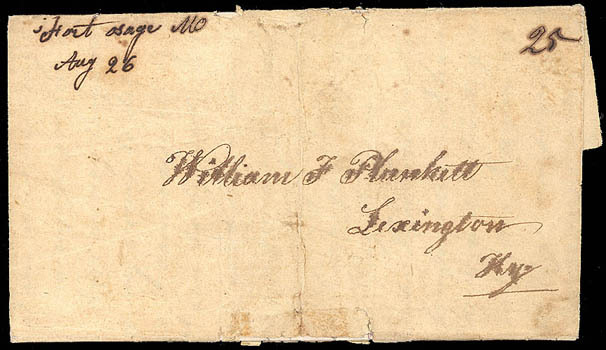 A RARE WILLIAM CLARK AUTOGRAPH AS TERRITORIAL GOVERNOR OF MISSOURI. Herculaneum is located midway between Saint Louis and Ste. Genevieve, on the Mississippi River. It was laid out by Moses Austin and Samuel Hammond, being the shipping point for lead from mines in Washington County. The post office was established on 1 October 1811. William Clark (1770-1838) was an American explorer, soldier, Indian agent, and territorial governor best known as one of the leaders of the Lewis and Clark Expedition. A native of Virginia, he grew up in pre-statehood Kentucky before later settling in what became the state of Missouri. Serving with Meriwether Lewis, they led the first American overland expedition across the Louisiana Purchase to the Pacific Coast and back, leaving from Pittsburgh on August 31, 1803, and returning to St. Louis on September 23, 1806. They claimed the Pacific Northwest for the United States. Before the expedition, he served in a militia and the United States Army. In 1809 Clark was appointed brigadier general of the militia, superintendent of Indian Affairs in the Louisiana Territory, and Governor of the Missouri Territory in 1813. During the War of 1812, he led military campaigns and established the first post in what is now Wisconsin. After the war he returned to his position as Superintendent of Indian Affairs until his death in 1838. 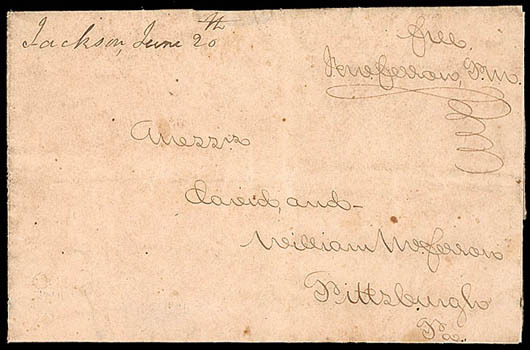 (Missouri) "Herculaneum, April 2nd", manuscript postmark and matching "10" rating on 1816 docketed folded cover to St. Louis; horizontal fold and light overall toning, a F.-V.F. 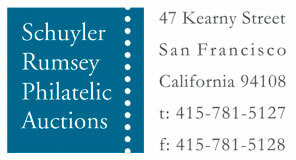 restored rate use. A RARE RESTORED RATE USE FROM MISSOURI TERRITORY. Effective March 31, 1816, the "War Rate" 50% surcharge in postal rates was repealed and the rates of 1799 and 1810 were restored. This cover was mailed just after the repeal and charge at the correct old rate of 10¢ for a distance of between 40 and 90 miles. 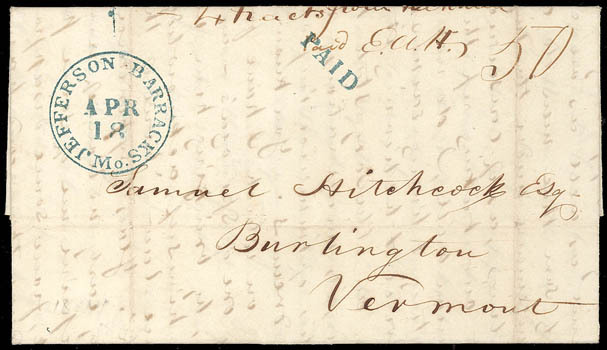 (Missouri) "Jackson, April 25", manuscript postmark with matching "25" rating on 1817 folded letter to Brattleboro, Vt., datelined "Jackson, County of Cape Girardeau (Missouri) April 23d, 1817"; some soiling, Fine. THIS IS THE EARLIEST RECORDED JACKSON POSTMARK. This letter is from an attorney who practices law across the Mississippi River in Illinois Territory. He reports to a friend in Brattleboro that the local judge has abandoned his office and returned home to Maryland. He suggests that the friend apply for the position. He reports on his first, wildly successful case in the territory: "I was very successful in some important causes when I first arrived in the Territory. One, on which a whole estate depended, I argued on the several points made, three days, and succeeded. A rich man had endeavored to take a large estate from the heir, who was poor, by fraudulent will. He had engaged, at a high price, all the bar. Popular indignation was realized against him to the highest pitch. I arrived just in time to take the poor man's part, and to advocate the cause of him and the people. I had no other business, and had time thoroughly to investigate the case. The court house as crowded with people from every part of the county, ready even to fight on my side of the question. I had been for four days searching and digesting all the law which could have any bearing on the subject. I could not refrain from being eloquent, and I reasoned better than I ever did before in my life. I drove them from their imaginary strong holds, till one of their most able counsel exclaimed, "this yankey is like a cat, if we toss him ever so high, he will be sure to come down upon his feet!" After the trial was over, the people presented me with a handsome sum, which they made up by subscription.". 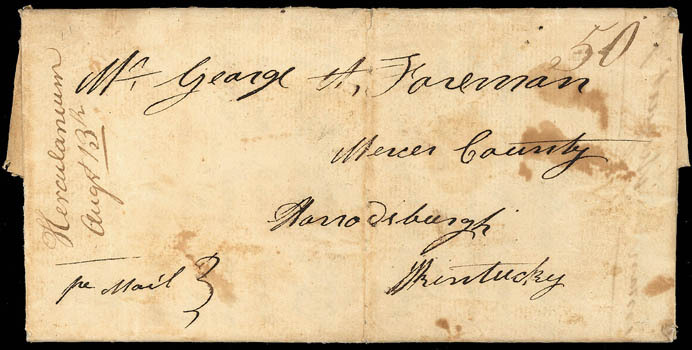 (Missouri) "Jackson, June 20th", manuscript postmark on 1817 folded letter with manuscript "Free, J. McFerron, P.M." free frank endorsement, Very Fine, This is the latest recorded use of this Jackson manuscript postmark. Jackson is located about 15 miles from the Mississippi River in Cape Girardeau County. The post office was established in 1811. 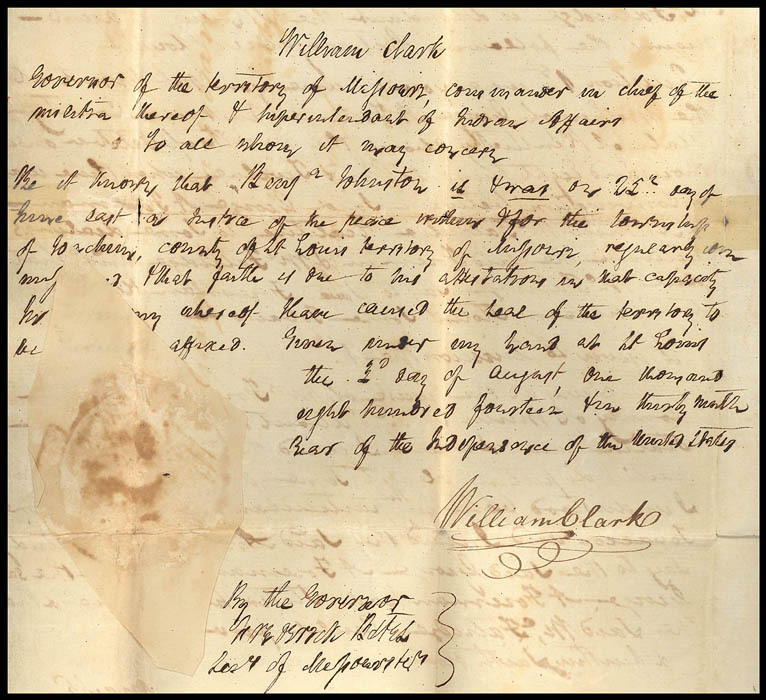 This letter was written by Joseph McFerron who was the postmaster at Cape Girardeau. (Missouri) Jefferson Barracks Mo., Apr 18, perfect strike of blue cds with matching "Paid" handstamp and manuscript "50" cent rating on 1844 folded letter to Burlington Vt., very long and studious letter from E.H. Hitchcock to his brother regarding textbooks and his studies in Missouri, fresh and Very Fine, ex-Risvold.